Born in Vancouver, Aidan Pendleton began her first training on the violin with Gwen Thompson at the Vancouver Academy of Music and then with Mayumi Seiler at the University of Toronto. 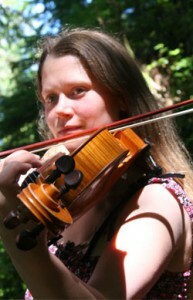 In 2001 she switched to viola and studied with Steve Dann completing her Bachelor of Music Performance. Hariolf Schlichtig at the Academy of Music and Performing Arts Munich, as well as Masterclasses with RivkaGolani, PeterOundjan, Arnold Steinhardt and David Zafer. Aidan has attended The Banff Festival of Music, the Orford Summer Music Festival and the Festival “Le Domaine Forget”. Aidan enjoys performing solo and chamber music, as well as orchestra performances. She was a solo violist for the Orchestra Academy of Schleswig-Holstein under Christoph Eschenbach and was invited in autumn of 2003 to be a member of theMunich Chamber Orchestra. In summer 2007, Aidan moved to Sweden to be principal violist in Musica Vitae, and in 2008 began a new role as principal violist in the Netherlands Radio Chamber Orchestra.